Queenstown’s Skyline Luge celebrated 20 years of family-friendly adventure thrills in July with upgraded facilities and increased capacity for visitors, future-proofing it as one of the resort’s top “must-do” adventures. Set high above Lake Wakatipu, Skyline Luge is reached by first taking a scenic 450 metre gondola ride to the top of Bob’s Peak. In the last financial year Skyline Entrprises says 920,000 visitors took the Skyline Queenstown Gondola experience, the steepest cable car lift in the Southern Hemisphere. With almost 50 percent of those going on to go on to “do the luge” it’s a pretty busy operation, and its set to get busier. Skyline Luge has two tracks for beginner intermediate or advanced skill levels travelling in purpose-built carts. They twist and turn through banks, cuttings and tunnels, with alpine scenery as the backdrop and stunning views across Queenstown, Lake Wakatipu and the Remarkables. Gentle and leisurely or steep and adventurous – once is never enough, says Skyline Luge activities manager Richard Ferguson. A three month project has seen the replacement of the previous two seat chairlift with a new fourseat, Doppelmayr chairlift that increased capacity to lift riders and carts to the top of an expanded instructional area. The revamp is the first stage of a $100 million development planned for Skyline Queenstown, intended to cater for projected growth in visitor numbers to Queenstown over the next 20 years. Gondola users are forecast to double in that time. Richard says the new luge chair can carry 1600 people per hour, with the operation capable of 1200 luge rides per hour. 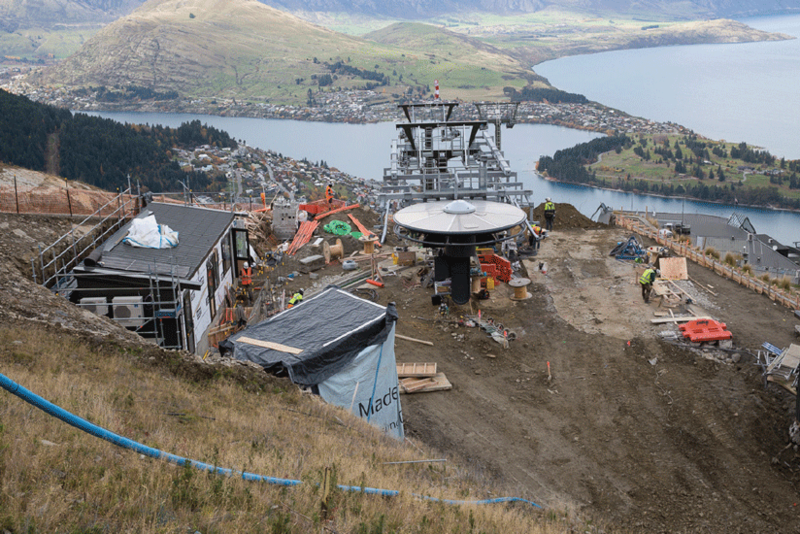 The Skyline Luge revamp is the first stage of a $100 million development planned for Skyline Queenstown, intended to cater for projected growth in visitor numbers to Queenstown over the next 20 years. The new configurations cater for current and future demand, providing for “better customer experience at peak times and also into the future,” he says. Naylor Love project managed the reconstruction without compromising the tourist experience, as the gondola remained open while the luge was closed for three months. Skyline Luge has an impeccable record of safety and quality control, having developed luge operations in six international locations including Canada, Singapore, and South Korea, as well as Rotorua where the first luge was built in 1985. Richard Ferguson puts the business success down to putting safety first, and then looking after their employees. “We’re lucky we’ve got a really good activity in a stunning location that almost anyone can do.,” says Richard. The Skyline Luge model is a huge success story, with many visitors at Queenstown being repeat customers having “done the luge” at one of the other four international venues. All up the company has hosted 45 million luge rides around the world, and more international operations are in the offing.